We firmly believe that every person in Christ is called to be His disciple and represent Him on earth. Once lost yet now found, our purpose is to share the Gospel that saved us in the first place through our words and actions. God has destined us to look at the fields and gave us the vision to conquer the world. Furthermore, we believe in the potential inside every person to become a leader. The G12 Vision is a discipleship strategy to fulfill the Great Commission. Revealed to and explained by Pastor César Castellanos, it is founded upon the idea that every Christian can mentor and lead twelve people in the Christian faith, following the example of Jesus. These four steps represent the pillars on which the G12 Vision is built. Spreading the Gospel and winning the souls around us kicks off the execution of the vision. By living out the example of Jesus, we get to guide and consolidate those who just started their new life in faith. In order to yield new leaders, we disciple them through biblical training (Ladder of Success), so that we can send them out to win new souls. 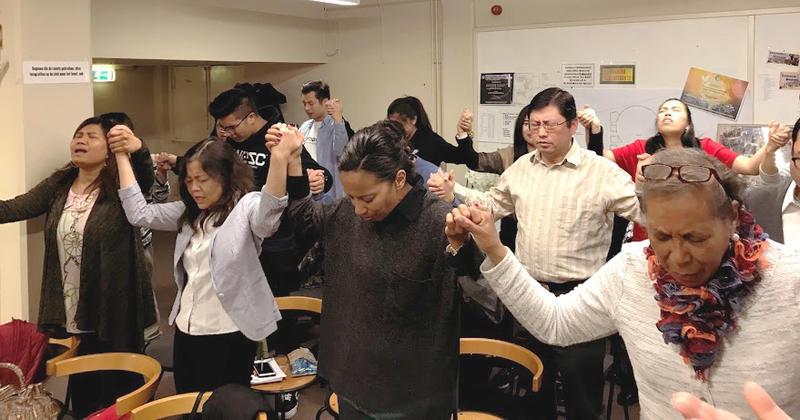 It is a weekly evangelistic meeting where we come together to teach the Word of God, pray for people’s needs, and motivate each person to evangelize and win the souls around us. It consists of fellowship, worship, a message and prayer. We believe that care groups play an essential role in the G12 Vision and its multiplication strategy. We believe that God has a purpose for every person in His house. By taking part in the Ladder of Success and a care group, one might receive revelations about their calling. All the different parts of the G12 Vision will function as the fundamental piece that drives the ministry. Thank you for taking interest! We will get in touch with you as soon as possible. Every year we have a new target, mission, we long to reach. For 2018 our target is 2-1-8: Within 2 months, 1 person will pray that 8 souls will be saved. We know that when we do this, the multiplication we pray for will happen.